On April 27-29th 2015, Fives Cryo Suzhou organized a 3-day seminar and training dedicated to a specific customer in China, Air Liquide. The event was designed in two sections, with 1 full day dedicated to a theoretical training, and then 2 days of practical hands-on training. The purpose of this training was to provide a better knowledge to the local teams on how to dismantle and assemble our cryogenics pumps, and also to provide good practices on regular maintenance of these pumps. 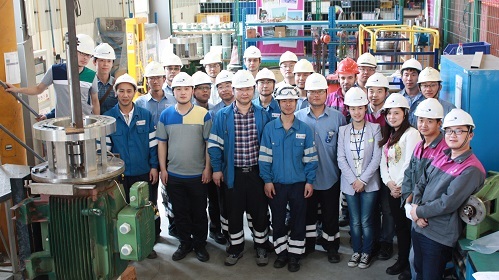 With a total of 20 engineers from different plants of Air Liquide in China, our customer has now an empowered team, able to deal with the most common maintenance operations and do some basic repairs in case of any failure. This ensures the best uptime rate for our customer, as well as an improved safety thanks to Fives’ procedures. Thanks to this 3-day training, Air Liquide gained enough knowledge to become confident in operating our equipment efficiently and safely.